A number of great fighters fought well into their forties and some of them – Archie Moore, George Foreman and Bernard Hopkins for three examples – arguably fought some of their best fights when at full veteran stage. And middleweight king Gennady Golovkin says he feels so good physically that he could very possibly do the same. Ahead of his huge, possibly defining fight with Mexican star Canelo Alvarez, Triple-G says he feels now “like I did ten years ago,” and that he foresees “probably five more years” in boxing. 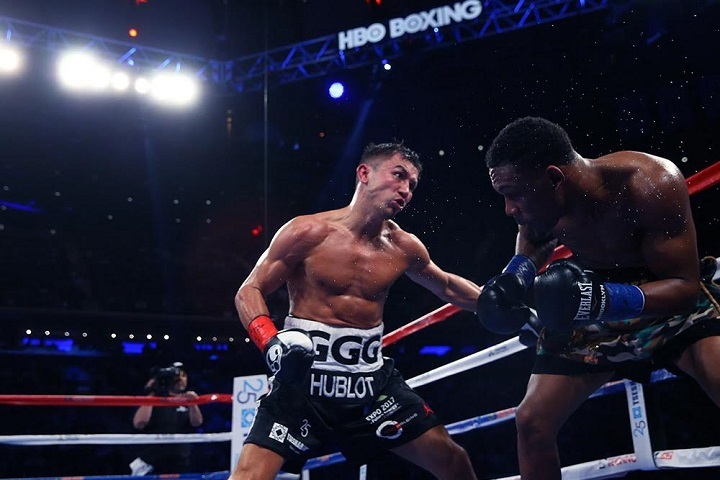 Some critics, in fact quite a few of them, suggested the unbeaten 35 year old champ showed his age in his last fight, when he at times laboured in his close decision win over Danny Jacobs. But was it Golovkin’s age that made the March fight so close and competitive, or was it simply the fact that Jacobs is such a good fighter? We may well get our answer a week on Saturday. It’s up to Canelo, at or about his fighting prime at age 27, to make GGG feel his age in their hotly anticipated battle. But right now, GGG says he feels great. The great old fighters mentioned above changed their approach, their style, as they grew older, adding wrinkles of one kind or another to their game. GGG has already shown his ring intelligence so it will be interesting to see if he can actually improve when he reaches veteran stage – if he hasn’t done so already. With a pro record of 37-0 and with an incredible 18 world middleweight title fight defences under his belt, he has achieved plenty. But GGG is shooting for history and right now he feels his expected war with Canelo will not in any way be the last fight of his great career. Of course, like any great fighter, GGG could grow old overnight. At age 35, this is the risk GGG faces each and every time out. Previous boxing news: Hagler’s age, slowing down gave Leonard his chance; will GGG’s age, slowing down give Canelo his chance?